So, I’ve just spent two fun days pretending that I owned an e-reader. I converted some books I owned to a file that my little XO (the OLPC laptop) could handle and cheerfully sat on the couch reading away. I can tell you that the four hours I spent reading two books far exceeded my tries at the Kindle and at the Sony E-Reader in both length and pleasure. It’s not that I have anything, at all, against the idea of e-books, although I would always be leery of dragging anything electronic to the beach, but there are a few…advances…that I need to see before I embrace to e-book as something that will serve as a real replacement for my physical library. First, I need the e-book catalogues to have more depth to them. Some of the books I own, I own because I cannot depend on finding another copy. They are not necessarily rare (as in expensive), but they are difficult to find. If I’m going to adopt an e-book reader, I want to be able to find all of those wonderful books as well. Second? Well, I’ve played with the Kindle and the Sony E-Reader. I was impressed with the e-ink technology. But, as someone who reads quickly, I really struggled with how often I had to refresh/change the page and how long it took for a new page to load. The e-reader also had a strange response to being set in portrait mode–it skipped back a section so that the last sentence you *had* been reading was suddenly in the middle of the new page. Needless to say, that drove me nuts. And, it didn’t solve my problem of having to load new pages every thirty seconds. And last? for now? I’m not sure how I feel about DRM. I am all for artists, writers, creators, and those who bring their works to the public, getting paid. I would, however, be very, very, very annoyed if a book I had bought suddenly stopped *working* because of an argument between a publisher and a distributor. Or, simply because my e-reader died for some reason. 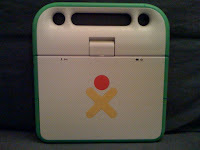 I did love reading my books on my XO. It was great to trot from room to room in the house with both the books and somewhere to type notes on them. The XO is light and has a great battery life, and, because it loaded the entire book at once, I didn’t need to wait for it load–I just scrolled down. I’m all for e-books. I would love for entire libraries to be so portable that they are available for everyone, everywhere. It just hasn’t happened yet.